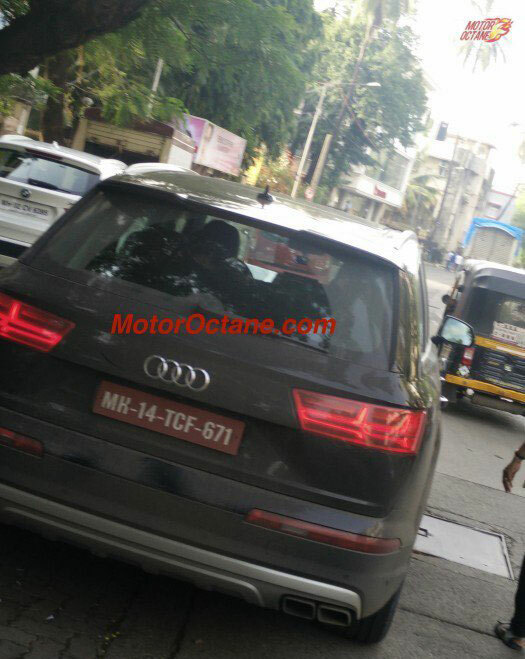 Here is a brand new car from Audi dubbed as Audi SQ7 which was spotted on Mumbai roads (in India) yesterday. The all new Audi SQ7 appeared without any form of camouflage and was captured first by MotorOctane when the car was doing testing rounds. The spotted car – Audi SQ7 is a car with added performance and inherits features from Audi Q7. The new SQ7 comes with quad-exhaust, bigger wheels & tyres as well as lowered suspension reported MotorOctane. Audi’s SQ7 looks very similar to that of Audi Q7 when you look at the exteriors. In fact, it’s very hard to distinguish between the two. When you compare interiors of Q7 with interiors of SQ7, both are very identical at the first glance. Audi SQ7 is going to be launched in North America and Europe within this year. 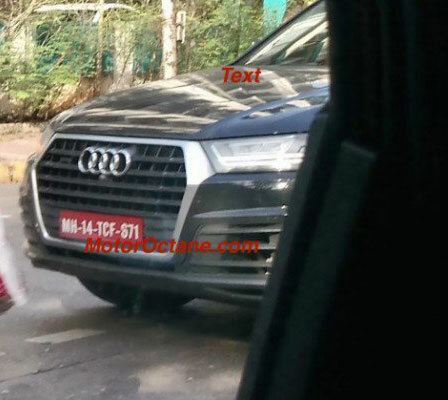 You can expect Audi SQ7 in India by next year(2016). The Audi SQ7 is equipped with 4 litre V8 petrol engine. Even though the new SUV by Audi is expected next year, the price is estimated to be in the range of 1.5 crores to 1.8 crores in India. The all new Audi SQ7 is very luxurious as compared to new Q7, and powerful as well. Audi Q7 would be launched in 2015 during the festive season. Q7 is the first flagship SUV by Audi and aims to be the best seller in its segment. Audi Q3 is already a popular and best selling car in its segment. Do not forget to subscribe to our newsletter for continuos automotive updates.